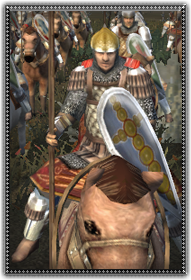 These are the elite troops of the medieval Georgian army, first appearing after the reforms of David IV the Builder (who reigned from 1089-1125). Monaspa gradually became the most disciplined, effecient, and heaviest cavalry force in Georgia. Under its strong charge enemy forces fall into panic and melt away without pause, knowing that collision with the the Georgian Monaspa means a collision with certain death.